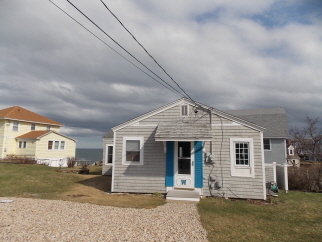 Sit on the roof-top deck of this ocean-view cottage and enjoy the sights and sounds of summer. This property is located by the edge of the Nubble overlooking open water to one side and the mouth of York Beach on the other. The 2 +bedrooms contain a king and queen bed and there are 2 full-sized futons in the living room and enclosed porch to sleep 4 more, for a total of 8 guests. Kitchen with dishwasher, 1 1/2 baths, washer/dryer, bbq and picnic table, yard and outdoor shower, parking for 4 cars, 3-season porch and newly available. 2 decks overlooking the ocean, fire pit and yard to relax and listen to the roaring ocean.